The Art of Flintknapping involves the production of many types of stone tools above and beyond projectile points. The items on this page are replications of actual artifacts from specific eras or regions which are perfect for use in the classroom, at guest lectures or for museum exhibits. As noted, these tools are available in labeled shadow boxes. 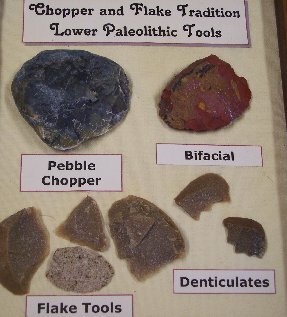 Also available here are combinations of such tools as displays from certain eras and regions. Currently only a few, but more to come. Please directly CONTACT US or use this Special Request Form (pdf) to obtain a quote for the replication of any other stone tools you might be interested in. Dr. "Arizona" loves a challenge. Just keep in mind the time involved in the manufacture, any items ordered please expect a month delay in shipping. This specialized tool is based upon a traditional Shasta Basketry tool. It is made out of Obsidian with one sharp end for splitting willows and a notch for stripping the bark off willows. This tool was first made by Dr. "Arizona" in response to a request from a Shasta basketry maker who has since used the tool with admirable results. Labeled display box alternative. This tool is still being debated in the archaeological world about its function. 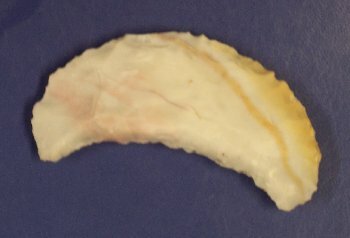 The object is half moon or crescent shaped. Options include either Obsidian, Flint or CCS. Comes in a labeled display box. This tool is still being debated in the archaeological world about its function. The object is butterfly crescent shaped. Options include either Obsidian, Flint or CCS. Comes in a labeled display box. 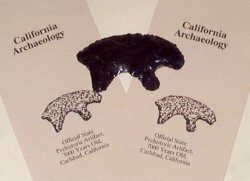 This unique artifact is an obsidian flaked eccentric which has been carefully shaped to resemble the bear shaped artifact which has been selected as the California State Artifact. One alternative choice comes in a special labeled display. These replicas may not exactly match the original piece but match the diversity in the style and material of the original. This is a small disc-shaped object pressure flaked to an edge on each face out of CCS. The purpose of such artifacts was unknown. Similar artifacts are found throughout the Southwest and Northern Mexico. Comes in a Riker mount. 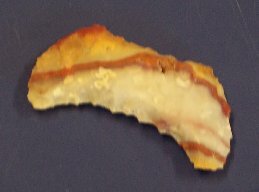 This artifact is a unifacial flake that is notched along one working edge to form saw-like teeth. Similar objects are found throughout New Mexico, Colorado, and Northern Mexico. Available here out of CCS and Flint material. Comes in a Riker mount. 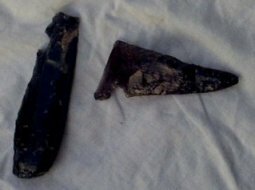 This artifact is believed to be a miniature representation of the larger ceremonial blades used throughout the Northwest region. It is made out of obsidian and could have been used as a decoration, a button, a nose ornament, or as a talisman. This is a small notched scraper made specifically for making basketry material and sizing the product for use. Such artifacts are found throughout the Northwest out of Obsidian. This tool is a quartzite cobble that has two or more flakes taken off of one side, producing a sinous working edge. 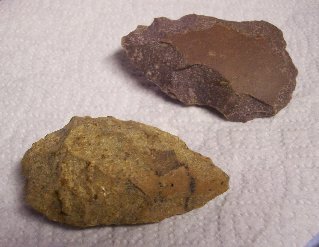 Tools such as these have been found throughout human history and were the earliest form of worked stone tool. This is specifically made as a replica of the Lower Paleolithic variety for use in any Ancient History or Introduction to Archaeology/Anthropology course. This four to six inch tool is a replica of the Lower Paleolithic tool known as an Achulean Hand Axe. 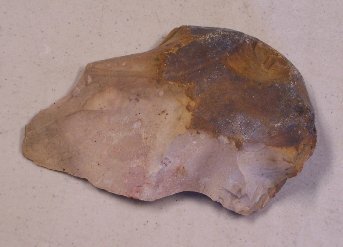 It is roughly bifacially percussion flaked which produces two sinous edges on the sides of this triangular artifact. It is either quartzite, flint or another similar rock type. 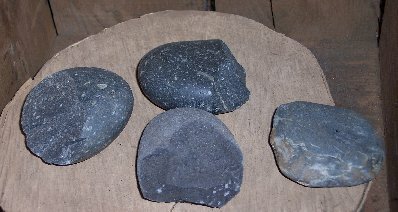 Great for use in the classroom to demonstrate the earliest stages of flintknapping. This quartzite four to six inch tool is a replica of the Lower Paleolithic tool known as an Abbevillean Hand Axe. It is roughly bifacially hard-stone percussion flaked artifact which is roughly triangular in shape. Slightly less developed than the Achulean variety with fewer flaking scars and a possible unworked section. Great for use in the classroom to demonstrate the earliest stages of flintknapping. This quartzite tool is a replica of another form of a Lower Paleolithic Hand Axe. It is roughly bifacially percussion flaked with a rounded edge and occasionally some cortex visible in the center or along a handling edge. Great for use in the classroom to demonstrate the earliest stages of flintknapping. This quartzite tool is a replica of the Lower Paleolithic tool known as an Cleaver Hand Axe. It is roughly bifacially hard-stone percussion flaked artifact with rounded ends and fairly straight sharp sides. Great for use in the classroom to demonstrate the earliest stages of flintknapping. This artifact is a replica of a Mid-Paleolithic Tool. 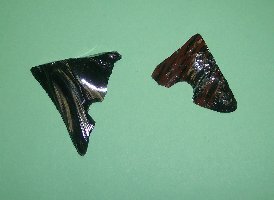 It is a percussion flake blade with a sinous "saw" edge. Great for use in the classroom to demonstrate the earliest stages of flintknapping. 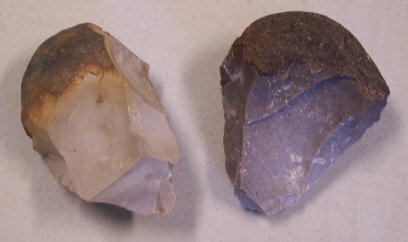 This quartzite tool is a replica of a Mid-Paleolithic tool that has been roughly hard-stone percussion flaked into a T-shape. Possibly used for scraping with the concave edges. Great for use in the classroom to demonstrate the earliest stages of flintknapping.